Properties in Cavalli Beach average 4.7 out of 5 stars. Villa with swimming pool, park and private pine forest, 100 meters from the sea. Property 2: Villa with swimming pool, park and private pine forest, 100 meters from the sea. Luxury Villa with Jacuzzi Outdoor 10/12 beds. Property 12: Luxury Villa with Jacuzzi Outdoor 10/12 beds. VILLA "AMALFI" ON THE SEA GALLIPOLI - MARINA DI MANCAVERSA SPECIAL 2019 !!!! Property 22: VILLA "AMALFI" ON THE SEA GALLIPOLI - MARINA DI MANCAVERSA SPECIAL 2019 !!!! Beachfront villa a few kilometers from Gallipoli and every tourist attraction. 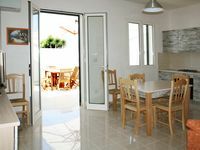 Property 25: Beachfront villa a few kilometers from Gallipoli and every tourist attraction. Villa Tentazione: A pleasant and spacious villa situated at a short distance from the beach, with Free WI-FI. 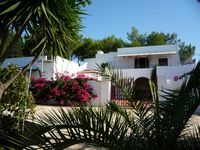 Property 36: Villa Tentazione: A pleasant and spacious villa situated at a short distance from the beach, with Free WI-FI. What wonderful place. We stayed in the Buganville apartment of the Villa Morocco, the last week of September. It was perfect; clean, comfortable, well equipped, great beds! This traditional thick walled architecture villa, is situated back of the coastal road, just far enough for peace and tranquility but 5 minutes to beaches, towns and the road that takes you every where in the Salento region. We particularly loved the spacious covered porch in the morning and in the evenings, listening to cicadas and crickets. We had the best sleep in this very quiet place. What a gift for our souls! We loved Elisabettas very detailed information printout, which we called &ldquo;the Bible&rdquo;, and took her suggestion to eat at Trattoria Tatanka, along the road to Santa Maria di Leuca; we had Orecchiette allo Scoglio, marinated anchovies and scampi&hellip;yummy, not to be missed! It is also easy to reach Beautiful Gallipoli and the Adriatic coast from the villa. Silvana, the local manager, was very accommodating and helpful. Overall a great experience and a perfect relaxing place. Well worth our long trip from New York. My only regret, it was too short of a stay. We will be back! We highly recommend Villa Morocco. Vincenzo was super accommodating with all of our requests (and there were quite a few). Even his father came over and brought fresh fruit and eggs and drove us to the supermarket. Cannot say enough good things about them! The house is great, we found it clean and in good condition. It is really walking distance to the beaches but they are very small and can get super crowded. Highly recommend a car for the area as there are countless beautiful beaches a short drive away.